WCU Alloy Main applications: For the spark erosion of dies of cemented carbide and for making high speed steel and switches and contacts in high and low voltage electrical devices. 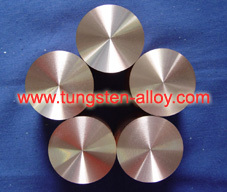 WCu alloy is the composite of Tungsten and Copper, which own the excellent performances of Tungsten and Copper, such as heat-resistant, ablate-resistant, high-intensity, excellent thermal and electrical conductivity. WCu alloy is easy to be machined. 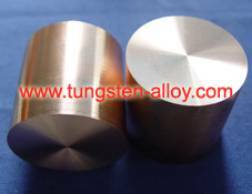 WCu alloy is used widely in such industries as engine, electrical power, electron, metallurgy, spaceflight and aviation. Using CIP formation, sintered tungsten skeleton and infiltrating copper (silver) technology, large size and special shape products of WCu composites with 6-90 percent of copper are produced, such as electric contacts, electrode, refractory parts, heat sinks and parts of rocket, We can also produce WCu alloy sheet material, tubing, plate and other small products by mould pressing, extrusion pressing and MIM.